One of the beautiful things about shooting RAW (other than the image quality) is that you don’t have to worry much about color space, gamma and profiles at the time of shooting (actually you do, but it’s a reassuring illusion nonetheless). All that goes out the window if you’re not shooting RAW on a video camera. You suddenly have to deal with getting the image right within the Rec. 709 standard, with or without the use of flat profiles or gamma modes. This article will help you understand what the adjustments and settings found on most video cameras mean. Just to clarify, I’m referring to the adjustments and settings you can manipulate for exposure and color specifically – other than the shutter speed, aperture, white balance and ISO. If you’ve ever shot on film, you’ll know that film comes in fixed ASA ratings (ISO). But how can a modern camera sensor move across an incredible range, like say, ISO 100 to 100,000 or so? The answer is that what you think is ISO is in fact, gain. Gain is electronic manipulation of the sensor image (this is a simplistic explanation of a really complex subject) – similar to what you get if you use tools in Photoshop or Resolve, etc. 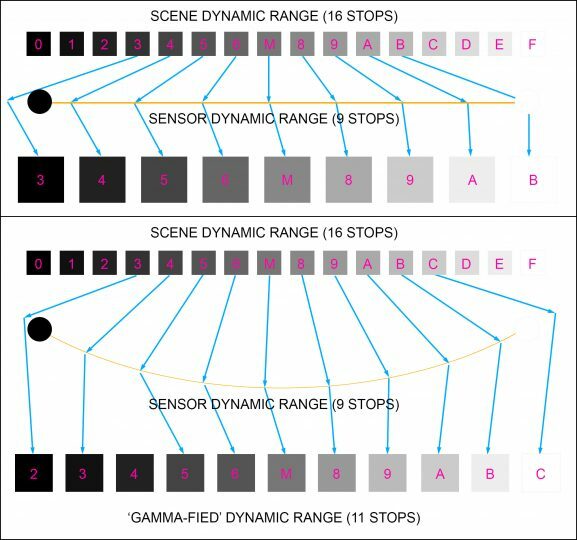 This is why every sensor has a ‘native ISO’ – the ISO at which it delivers the maximum dynamic range. ISO is fixed to represent photography standards and light meters. E.g., ISO 50, 100 is a universal thing. Gain is camera-specific and science-specific. E.g., 0 dB for Camera A is not necessarily the same as 0 dB for Camera B. Before the DSLR revolution ISO was only used in film. Videographers always dealt with gain. Manipulations for both gain and ISO are done on sensor RAW data, for maximum image quality. This is why it’s better to use the in-camera gain or ISO rather than boost levels in post processing. Cameras that shoot RAW do so at the native ISO (0 dB gain) so you can adjust this in post production. Both produce noise, and this is dealt with internally. Moving away from 0 dB and native ISO is always a recipe for adding more noise. Okay, if going up from ISO 50 to ISO 100 doubles the light, how much will be ‘gain’ equivalent? 6 dB. Every 6 dB doubles the light. It also adds 6 dB to the noise. This makes gain a better variable for understanding noise. Two stops would be 12 dB and so on. What should you do if faced with gain or ISO or both? Find the native ISO and equate that to 0 dB. Then move 6 dB for every ISO stop and you’re good to go. If the gain levels in your camera is not in 6 dB multiples, then use the in-camera meter or light meter to see how many stops each gain setting will provide, and commit that to memory. That’s easier than pulling out the scientific calculator. That’s all you need to understand or care about gain. I have already explained gamma in What is Display Gamma and Gamma Correction? Let’s say you have a suitcase and want to pack for a holiday. Will you lay your clothes out straight, or will you fold them to save space? Folding clothes is the equivalent of applying a gamma. You’re trying to fit one thing into another to save space (or something). Let’s take this scenario: You have to put clothes on a clothesline, but with the condition that they must be equally spaced apart. If the clothesline is straight, you can fit x number of clothes on it. However, if the clothesline is curved, you can fit more than x clothes on it. The image is for representation purposes only. M stands for middle-gray. If a scene has 16 stops of dynamic range, and the representation of this is ‘linear’ (actually it’s not correctly linear, but Rec. 709, which contains a gamma in itself) you can fit 9 stops of the scene on the sensor. This is assuming our sensor can only hold 9 stops of DR.
Now, by some creative math, we stretch the clothesline (gamma) a bit more. Make it curvier than Rec. 709. Suddenly you can squeeze in 2 more stops. But there’s a catch. If you watch the latter image, it will look ‘flat’ and ‘lifeless’, as if the whole scene were shot through fog and desaturated for good measure. The above are not the real gammas, just representations to show you how the flatter gammas try to increase the length of the clothesline by becoming more curvier. The last one’s a joke. Or maybe not. I have already explained this in What is Composite Video and IRE? Suffice to say, IRE is the normalized luma representation of voltage and light in terms shooters can understand. Easier to understand 0-100 IRE than 0.285 mV. For HDTV Rec. 709, 0 is black, 100 is white and 100-109 is ‘super-white’ or headroom. Just because you have this entire range doesn’t mean you can use it all. That’s what the next section looks at. From the IRE values, you can find out how many stops of DR Rec. 709 can carry. It happens to be 26.77 = 109. This means, Rec. 709 is not capable of more than 6.77 stops at its best. You absolutely need to know if your camera is supplying you full swing or studio swing. The direct tool that lets you know this is the waveform, as explained in the link above. What is the dynamic range capability of Rec. 709 in studio swing? It is 26.43 = 86. This means, Rec. 709 programming will not display more than 6.43 stops in studio swing. In daily usage though, we say Rec. 709 is only capable of holding 6.5 stops of dynamic range. Since almost any modern camera is capable of better dynamic range, gammas have become fashionable. So far we’ve looked at some of the ‘exposure’ settings found on most video cameras. In Part Two we’ll cover a few more and the settings which deal with color manipulation.